The Lions were made to work hard to extend their unbeaten record to ten matches in South Africa. Four tries and Phil Bennett's goals helped the tourists to a 23-15 win against a strong Transvaal outfit; all of the home side's points came from the boot of outside-half Gerald Bosch. Ian Kirkpatrick came on as a replacement for captain Brian Lochore and scored a hat-trick of tries in the All Blacks' 27-11 demolition of Australia in a Test Match in Sydney. 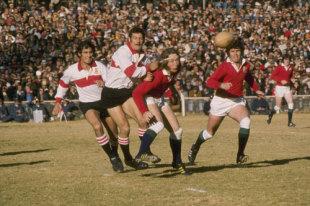 It was Kirkpatrick's only appearance as a replacement for the All Blacks, in his second Test, and he would go on to face the British & Irish Lions twice. He was an ever-present as the All Blacks slipped to defeat in 1971 and again in 1977 when they gained revenge against Phil Bennett's tourists. Wales wing Nigel Walker was born. Walker represented Great Britain in the 110m hurdles at the 1984 Olympic games in Los Angeles before turning to rugby after missing out on the squad for the 1992 games in Barcelona. He joined Cardiff RFC and made his debut for Wales against Ireland in 1993. He went on to win 17 caps for his country, playing his final international against England in 1998. The Lions emerged successfully from the first Cape Town match of their tour in South Africa, beating the Western Province Country XV 9-3 at Newlands. England centre Will Greenwood returned to Harlequins after a spell with Leicester. Greenwood left the Stoop to join the Tigers in 1996. He quickly made a mark with his powerful running , forcing his way not only into the England side but also into the victorious 1997 Lions squad in South Africa but injuries initially curtailed and frustrated his progress with the Tigers. Ireland's Sammy Walker captained the Lions and led them to victory when he scored a try and kicked a penalty goal to help beat Griqualand West 22-9 in Kimberley. Border are the first South African provincial side to lower the colours of Fred Allen's All Blacks, beating the tourists 9-0 in East London. Future Springbok captain and one-test wonder Basil Kenyon scored the only try of the game. John Thornett's Wallabies begin a 24-match tour of South Africa with a 14-0 triumph against Eastern Transvaal in Springs.